Workshops with Nita are a great tool for team building and helping people deal with anxiety. Guided group meditations also available. The Meditation Handbook for Beginners is based on a six week meditation course. Nita offers group guided meditations and individual meditation coaching. Trust, acceptance, and respect, are the foundations of a strong relationship. There is nothing we cannot accomplish when we value and trust one another. Unfortunately, the common habits of gossiping and judging keep us from maintaining this basic groundwork necessary to build a strong and cohesive bond. This workshop is designed to help participants identify and overcome harmful habits that erode trust and acceptance. To learn more download the PDF. Click here for more information on Nita's Team Building Workshop. The habit of anxious thinking is an ingrained, common problem for people in their work and personal lives. This leads to unnecessary stress that reduces focus, causes fatigue, and robs people of happiness. To learn more download the PDF. Click here for more information on Nita's Anxiety Workshop. I walked into my first seminar with Nita having recently received my master’s degree in Clinical Social Work. My head was full of theories and techniques for use as a family therapist. I walked out of Nita’s seminar with a capacity to recognize and honor my own intuition. This has given me invaluable skills to utilize when working with my families. As a result of Nita’s seminar, I now have received respect for my inner knowing to balance my theoretical knowledge. I can’t thank you enough for making the retreat such a success. I’ve enjoyed meeting you. In fact, I felt I’ve known you forever. You certainly put all of us at ease. Your energy, brightness and wonderful smile was infectious. Thank you for the reading - it put a smile on my face which is still with me today! Thank you again - I look forward to seeing you again. Everyone who attended the retreat has responded with such positive comments, such as, “Just amazing,” “So awesome,” etc. I’m quite sure they all came away with something, not only that comforted them, but something they can work on. Just so you now, Nita - you are making such a difference in our world. Nita's workshop was one that helped me grow personally in many different ways. Not only was the reading she gave me right on point, but she was also able to teach me valuable ways to deal with anxiety. She taught me strategies on how to change negative self talk into self love. Her hypnotic guided meditations helped with relaxing me and helping me find my true self. Thank you Nita for a life changing weekend! I have had the pleasure of working with Nita for almost 4 years now. She is an amazing teacher. Because of how much she helped me grow, I hired her to do a weekend workshop at our spiritual learning center. The grace that she has to teach people never ceases to amaze me. She was born to be a teacher. She is SO amazing at her gifts and so talented in helping others find their gifts as well. Whatever you hire Nita for, whether it be readings, mediumship or workshops, she will not disappoint. She is simply amazing!" Thank you so much for bringing Nita to Back to Eden! What an incredible person and a wonderful instructor. I feel fortunate to have been a part of this weekend workshop. Thank you for the healing. "What a great weekend workshop! Thank you for putting this all together and bringing Nita here to CT. What an amazing experience. It was a lovely couple of days!" Nita’s Anxiety and stress management workshop was truly the most impactful workshop for our employees, and it was the most needed. In our industry, like so many others, stress and anxiety are rarely discussed, and addressed even less, yet they are such a big impact on productivity, turn-over, and even culture. 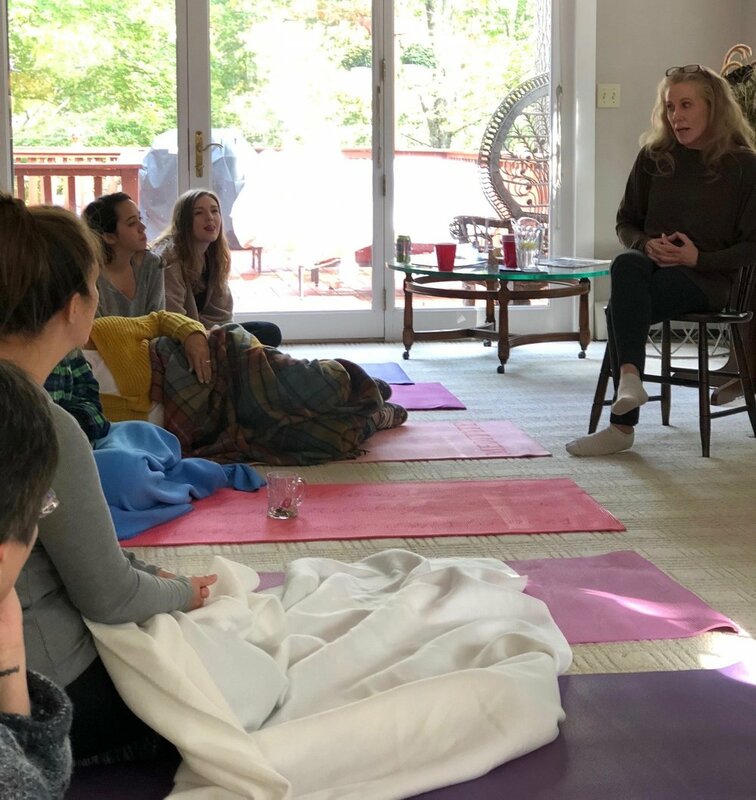 Nita’s authentic approach resonates with people, and her simple and effective ways to teach people how to deal with anxiety and stress were true gems to our staff. We are forever changed and forever grateful. We can’t wait to bring her back! Nita Lapinski provided a stress management workshop to my team at Strayer University. This was a group of mostly PhD-prepared academics with vast collective experience in education. My team was deeply impressed with Nita's message and approach. They enthusiastically embraced Nita's exercises and provided me with abundant positive feedback. Nita's approach is both well-informed and relatable. She comes across as an expert at her field and yet she is able to connect with her audience and provide pragmatic and actionable approaches to stress management. I highly recommend this workshop for any corporate team working under deadlines toward ambitious goals. I thought that Nita's Team Building event at our office was very well done and beneficial for me personally. It is much easier to work as a team when you understand each person's strengths. Nita was able to get us to individually share a bit about who we are, which proved to be a benefit for all. Nita had our team pair up to give a hands-on example of how powerful our thoughts are. She was very real with us, sharing personal examples of her own to help us understand. I felt very comfortable and connected with her and would recommend this team building event. We had Nita for a team building training at work. She is amazing. What we learned about ourselves and each other only helped us work as a team more cohesively. She is attentive and takes her time listening to everyone and what they have to say. I would definitely have her for more trainings in the future. *Nita is also available for group meditation workshops. Email Nita at NitaLapinski@gmail.com. Click here to download more information.